Kendo practitioner (fight with shinai, bamboo swords) and director Shinya Tsukamoto’s first venture into his country’s samurai traditions with Killing, which he touts as a small world tale tribute to Akira Kurosawa’s sprawling epics, like Seven Samurai (1954), is a slight metaphor about kendo and martial arts combative competitions. Disguised as a Shinto-esque, dynamic reflection of a samurai’s relationship with his sword as after the multi-folding process of steel gives birth to a samurai sword, we learn how the spirit of Bushido has changed over the years as a young warrior is embattled in his struggle to honor the key component of the samurai code…the art of killing. Quick samurai history: prior to 1185, samurai warriors were the most important class due to being local police forces for the ruling central government; from 1185-1333, a new Shogunate gained military control over the country as samurais pledged to keep peace in return for lands of rich aristocrats; from 1336-1573, after the Ashikago shogunate moved the capital to Kyoto and disunity led to samurais fighting for local daimyos instead of a single shogun, the central government weakened; from 1600-1868, all samurais were loyal to the powerful Edo based Tokugawa shogunate; and the age of the samurai and shogun died as Commodore Perry’s arrival to Japan ended their isolationist policy. Yet before and during WWII in Japan, kendo was a required course in school, and instructors used it to encourage the fighting spirit and instill a sense of national pride in students based on Japan’s samurai warrior past. After WWII all swordplay combative forms were banned until 1950 when it became a sport. That being said, Killing takes place toward the end of the Ashikago shogunate as samurai warriors were inspired to fight for the rising Tokugawa Government and thus began to hone their skills in preparation for the next civil war. 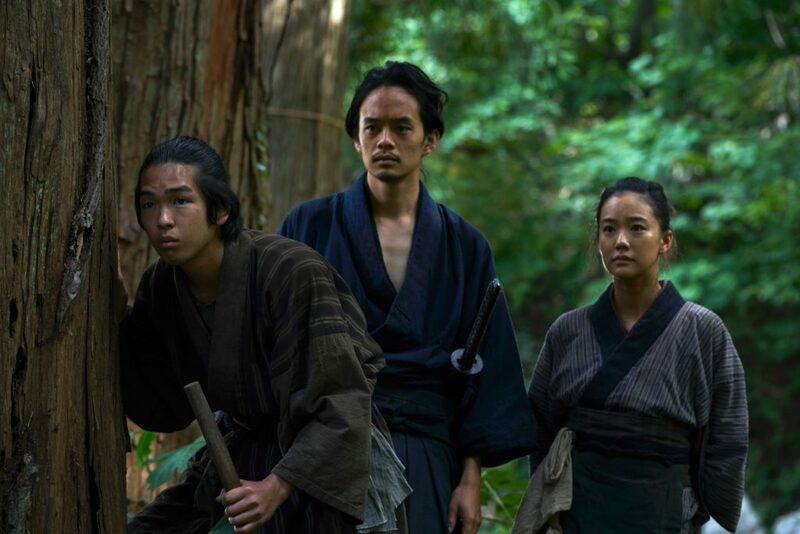 The film opens with young almost samurai Tsuzuki (Sosuke Ikematsu) fighting the younger samurai wannabe Ichisuke (his sister Yu dotes for Tsuzuki), using boken (solid wood-shaped samurai swords). The sequence reveals Tsuzuki’s speed, skill and calm as he easily lands four pseudo-deathblows. 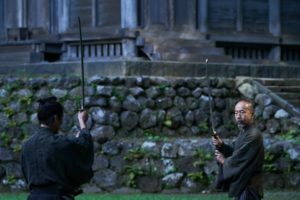 In another neck of the woods, two masterless samurai (ronin) duel with real swords. The easy winner Sawamura (Tsukamoto) dispatches his opponent with a single, quick sword slash. When Sawamura observes the boken-wielding lads, he’s impressed and recruits Tsuzuki to accompany him to Kyoto to fight for the new shogunate. Yet is Tsuzuki ready to follow the code where obligation supersedes guilt and loyalty repudiates antipathy? When Tsuzuki realizes that the core duty of a real samurai is to kill without hesitation and question, and face the consequential bloodletting that follows, the fear of death and the sight of blood creates such a major panic attack that he develops illness to get out of going to Kyoto. In regard to combat, to be a true samurai during Japan’s feudal period, one’s sword must taste blood and Tsuzuki has never had that meal. The boken training sequences are shot with medium angles that snap zoom in and out to create strike and block intensity while providing clarity of each skill’s purpose. They’re sparring, though one can get hurt, no blood is spilled, the fights aren’t real so the emotional content of death over life isn’t necessary. Side note: Japanese films, including Killing, often feature an insect motif; it’s a remnant of respect to the country’s last official emperor, Hirohito, who was an avid entomologist. 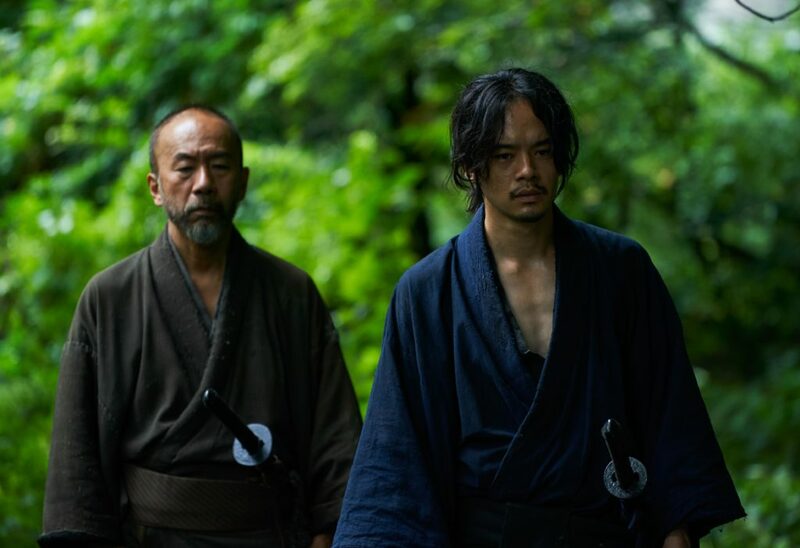 Things get messy in Tsuzuki’s world as vagabond ronins kill villagers and Sawamura tells Tsuzuki that it’s up to them to take revenge, plus, he wants to see Tsyzuki in action before they head to Kyoto. What follows are some excruciating bludgeons of blood, artery, gore squirt, dismemberment and violent retribution that don’t go as planned, which sets us up for an ending where we learn the true reason why Sawamura recruited Tsuzuki and the answer to the question…is Tsuzuki ready to follow the code where obligation supersedes guilt and loyalty repudiates antipathy? Killing is similar to many chambara (sword fight) films of yesteryear because they too averaged about 3-4 minutes of fights scenes per movie, where also akin to Western gunfights, the drawn sequences of posing and posturing up to the final gun/sword draw were important parts of the climax. Yet the violent combat in Killing was shot in a way to accentuate the swiftness and mayhem that comes with real, life-threatening duels and so the action isn’t about the audience reveling in the grandeur of magnificent maneuvers but to feel gutted by the end result, the helpless feeling of your blood and soul dripping away from your body. Point being, kendo competition and even something like MMA will never cross that line…and so they shouldn’t. To a warrior, fighting is about survival, you don’t hear the cheer of a crowd but you might here the voice of god. It’s comparing the use of real swords vs. wooden swords, the reality of war vs. the non reality of competition, death by sword vs. pain by bouts with rules. I remember a story about the famous American college football coach Bear Bryant who once told his team that football is like war. A player stood up and said, “I’ve fought in a war sir, and I can assure you football is nothing like war.” Bryant apologized. SDAFF 2018: LONG DAY'S JOURNEY INTO NIGHT - What the hell? Yes.